March, 9(1). General issue. Edited by Jo Mynard. September, 9(3). Special issue featuring papers from the AILA Congress: Research Network on Learner Autonomy Symposium, Rio de Janeiro, July, 2017. Edited by Jo Mynard, Diego Mideros and Christine O’Leary. December, 9(4). General issue. Edited by Diego Mideros and Jo Mynard. March, 8(1). General issue. Edited by Jo Mynard. June, 8(2). Special issue: Papers from the 7th Independent Learning Association Conference in Wuhan, China, 4-7 November 2016. Edited by Kerstin Dofs and Moira Hobbs. December, 8(4). General issue. Edited by Kevin Knight, Jo Mynard and Erin Okamoto. March, 7(1). General issue. Edited by Jo Mynard. June, 7(2). Special issue on virtual and other learning spaces. Edited by Curtis Edlin and Jo Mynard. September, 7(3). General issue. Edited by Jo Mynard. December, 7(4). 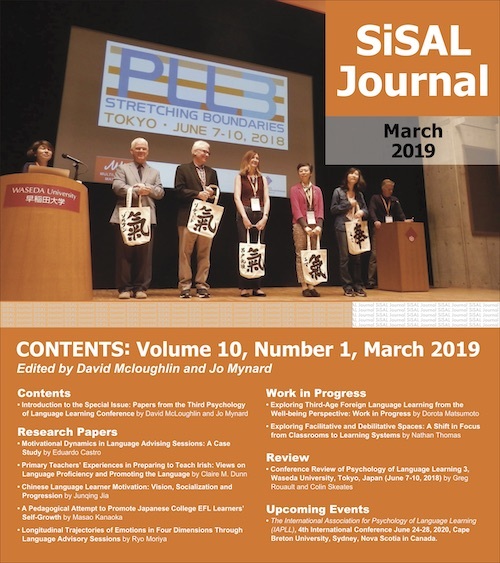 Special issue on Japan. Edited by Jo Mynard. December, 6(4). Special issue on young learners and self access. Edited by Annamaria Pinter, Robert J. Werner and Jo Mynard.